Cryptic News from the Willow Creek View. Transhuman Sasquatch Strangeness from the Middle of Nowhere. A Voice Howling out from the Klamath-Trinity-Siskiyou Wilderness. This is the Megaphone of Steven Streufert and Bigfoot Books, a Used Book Store in Willow Creek, Humboldt County, Extreme Northern California. MEETING MR. ROWLAND, LONGTIME BLUFF CREEK WORKER. 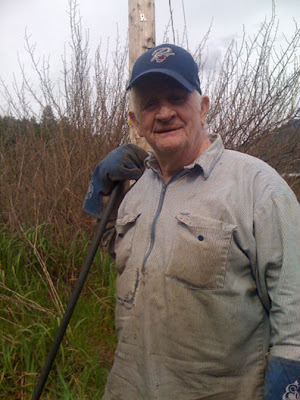 On a tip from Al Hodgson, we spoke briefly a few days ago with local old-timer, Mr. Jay Rowland, as he was clearing blackberry brush on our off the beaten track dirt country road. It's funny that all of this information was living right next door, basically, to our cabin all of this time. We've said it so many times before: do your Bigfoot hunting where you live! Or move to where you can Squatch. As you might recall from our interview with Al, he is the one who revealed to us that the elderly couple living just diagonally down the hill from our own hilltop cabin home was a man who was THERE in Bluff Creek back during the vital, early days of Bigfoot reports in the area. He confirmed to us that he worked up there with the Wallace brothers, Ray and Shorty, in the late fifties. He actually lived part-time (weekly and seasonally) on the site in a trailer, essentially at Louse Camp, from the early sixties to the early seventies. According to him there was NO WAY those guys faked all of the tracks found up there. He agreed that the Wallace brothers were not even necessarily at the site during the times the most famous footprints were found, in 1958 and 1967, and many more tracks were found that have not been publicized. He has agreed to do an interview with us sometime soon, on the record, regarding Bigfoot and the history of Bluff Creek, about which he knows apparently a LOT. He also confirmed to me that he KNOWS that Wallace didn't make those tracks, as he has seen them after Wallace died (he might have been talking about "Shorty" Wilbur Wallace there, not Ray Wallace). Image: The man himself, at the bottom of Panther Road in Willow Creek, 2010. Photo, Steven Streufert. All images CLICK TO ENLARGE. 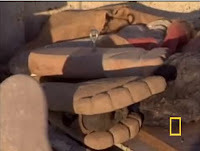 Also, historical photos of tracks in the ground and castings that look suspiciously like Ray Wallace's footprint stomper, middle. Also included, one of Ray Wallace's faked Bigfoot photos, this one of his wife in an ape suit. He told us of a time when he was up on the Bluff Creek road construction project and a massive slide had blocked the road in to the work site. He had stayed the night up on the other side of the slide. No one else was around, and no one could have gotten in there without a major long nighttime hike; and yet, footprints were found by him the next day, before he had to go down with the Cat and clear the slide from the top end. Another time he had slept out on the ground one night, alone up there again, and awoke in the morning to find huge footprints going all around his sleeping bag. "It was as close to me as I am to you," he said to us, as he moved forward to within three feet of where we were sitting in the car. As we mentioned briefly in the interview with Al Hodgson, we spoke a year ago with another local Willow Creek guy with a similar background, Joe Ramos, now sadly dead but who was 92 when we interviewed him (this interview was done OFF the record, unrecorded, and we have only handwritten notes). Mr. Ramos had said he'd seen the footprints and such, too, but that he felt the whole thing was "99% a hoax." What about the other 1%, then, we said? This got a bemused chuckle and a shrug of the shoulders. Ramos worked one creek over from Bluff Creek, in the Blue Creek and Red Mountain area, on another crew than the Wallace one. He felt that all of these reports of footprints and equipment vandalism were just shenanigans, not caused by "Bigfoot." He admitted, however, to feeling tremendously spooked late one dark night while sitting alone in his truck up on Bald Hills Road, for absolutely no reason at all. There was just "something" out there, he said. Mr. Rowland laughed at this story, but somehow didn't know Ramos. There are a lot of these Bigfoot-connected old-timers still living around Willow Creek. Some come into our Bigfoot Books store with their stories. Many of them are jokers and tall-tale tellers who like to pull your leg; but Jay Rowland stands in contraction to this tendency, insisting the tracks were real, not hoaxed, and seeming utterly sincere while saying so. Rowland told us he started living at the Bluff Creek site in 1960 or thereabouts, working on logging projects in the same area as and sometimes with the Wallace company. We are hoping to explore any firsthand things about the Jerry Crew finds of 1958, as he knew Jerry and the others working up there then. He worked in the area all through the major Patterson-Gimlin Film (PGF), Blue Creek Mountain and Onion Mountain events and thereafter until 1972. He was there in 1963 when Al Hodgson cast tracks at the Notice Creek-Bluff Creek confluence, and he knows why Al's track cast has a crack line in it--the cast was dropped on the way up out of the creekbed. The very next day on our way to work we talked again, off the record, to Jay Rowland, for a full two and a quarter hours. Sorry to all the folks who may have stopped by the bookshop, but Bigfoot made us late! He's a literal goldmine of Bigfoot information. He told us the last thing he's ever going to do is spread around a bunch of lies, and that he hates "bull" more than anything else. He was actually a bit angry at John Green, though, after all these years, as Green had promised to mail him a copy of SASQUATCH: APES AMONG US, as Rowland had done a three hour interview with him way back in the day. John, if you're reading, Mr. Rowland is still waiting for his copy of your fine book. 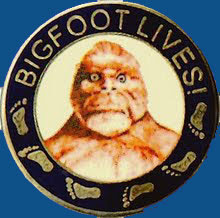 Oddly, despite all of the tracks he's seen, he never actually SAW a Bigfoot, and he doesn't believe the PGF is authentic. 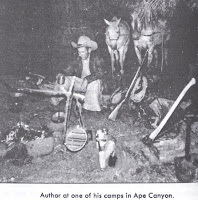 He was in the area that year until November 1967, with his trailer set up at Louse Camp, just downstream from where the two famous guys camped, and did not see Patterson and Gimlin once. Odd, indeed! Images: Above, Ray Wallace, known Rascal--but did he fake the prints or just copy the shape? Next, Roger Patterson and a quite differently shaped track cast. 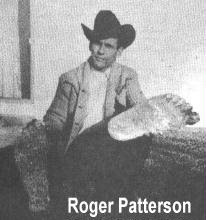 Below, Roger in one of his Bigfoot expedition camps. Historical. Then later, strangely, he claimed that "they made $20,000,000 on the film," and that "the other guy with the film" (could he have meant Al DeAtley instead of Bob Gimlin?) was a member of "The Syndicate." Ummm.....? Rowland made sure to emphasize that by "Syndicate" he meant Organized Crime. He must have meant someone else, as Gimlin has said repeatedly that he never really made even one red cent off the film, and besides, he has always worked for a living driving trucks and managing horses, never displaying any inordinate forms of wealth. Patterson himself died poor, owing people money. So where does this twenty million bucks come into the picture? News to us, we say, a thing that we hope to get to the bottom of later. Mr. Rowland promised to do a full, on-record, recorded interview soon, so keep your eyes on this blog for further explorations, and we hope, new revelations. Interested in seeing what an utter NUTCASE Ray Wallace was? Check out David Paulides' and NABS' absurdly credulous presentation of his oddball letters to Ray Crowe and the Western Bigfoot Society HERE. Prepare yourself for UFOs, and oh so much more inane lunacy. We promise, you WILL be entertained. They're fun, but please don't take this crap seriously, folks. Ray Wallace was some kind of a hoaxer and crank, but almost certainly not one good enough to fool John Green, Rene Dahinden and for that matter Jeff Meldrum. Just look at the old photos of the other, ridiculous "footprints" that Wallace tried to sell in his roadside stand. Will Paulides come out as a Alien-Bigfoot believer next? We eagerly await it. Dave, just because some old story has a Native American telling you something about a Bigfoot, doesn't make it necessarily literally true. If it did, we'd expect NABS to believe in a shape-shifting Sasquatch, too. Here, you can see the "BIGFOOT CAGE" at the Bigfoot Motel in Willow Creek, formerly known as Wyatt's Motel. This is where Tom Slick and the Pacific Northwest Expedition, including John Green, Rene Dahinden, Bob Titmus and Peter Byrne met up in 1959. They stayed in the motel rooms, not the cage, by the way. 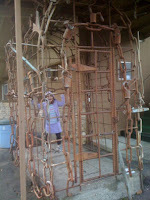 The cage didn't catch Bigfoot this time, but rather our own kid, Denali Brown, who is growling furiously. We are working on a new project which we are calling "LETTER TO A YOUNG BIGFOOTER" (after Rilke). Actually, a middle school kid from Southern California sent us a letter asking questions for a school project about the world of cryptozoology, Sasquatch, Bigfoot research, and what it's like to be a part of it. What, basically, is it like to explore things that the majority of society views as crazy? We started by thinking the answer to this would be a simple few short sentences per question, but now we find there are no simple answers. Look for that in an upcoming blog entry. For those of you who may not have noticed, the founder of the BFRO has been quietly adding some very interesting new content to the BFRO website. He doesn't put his name on the main page as a byline, so it might be easy to miss. The site has recently been subtly updated, so check it out! Articles by Matt address important current issues, including the inaccuracy of the Wikipedia Bigfoot page, false claims of hoaxing the PGF, and the re-emergence of notorious hoaxer Cliff Crook (appropriately named!). Of particular interest is Moneymaker's legal argument for the prosecution of hoaxers like those involved in the Georgia Bigfoot Body debacle. * Was the Patterson-Gimlin Film Ever Proven to Be a Hoax? * Also, new to us anyway, is the BFRO DISCUSSION BOARD, "The Blue Forum"
Images, above and below: 2010, Steven Streufert. Willow Creek is starting to gear up for its annual Labor Day Weekend BIGFOOT DAYS. This 2010 year will be the 50th Anniversary of the event. 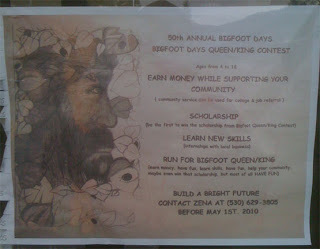 Recently a preliminary poster appeared in the window of the Willow Creek Community Service District calling for contenders for the Bigfoot Days King and Queen Contest, the winners of which are referred to as "Little Miss and Little Mister Bigfoot." Al Hodgson is working on a photo collection for display during the event, and wants to get John Green to come down to be master of ceremonies and give a talk, health permitting. If you would like to speak at the event or participate in any way you might want to call the number on the poster (530-629-3805, click to enlarge poster) for information, or drop us an email at bigfootbooks@gmail.com and we'll try to help with the connections. Read our previous blog entries on Bigfoot Days in Willow Creek HERE and HERE. 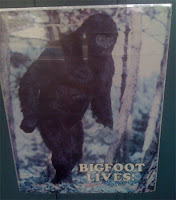 Image: Also found at the WCCSD is this cool "BIGFOOT LIVES" poster, prominently displayed at the front desk to announce the District's formal belief in the Creature. Steve Paine, who manages the parks and utilities District, told us he used to interview famous Bigfooter elder Al Hodgson every weekend for several hours, talking about local history. He showed us a file folder several inches thick that was full of transcripts, photos, and notes from Al. What a gold mine! He spoke enticingly of having a whole big box of Bigfoot material, too, but we have yet to see it. Another goldmine, containing only Paine knows what! HAPPY CAMP TRACKWAY FOUND! Or NOT? Bigfoot Field Reporter Sharon Lee blogged on her great blog about a new footprint track find by formerly Biscardi-connected Tara Lee Hauki, on February 2, 2010. It looks dubious to us, though, in extremis. They claim dermal ridges were left in melted snow, which we find simply not at all credible. How BIG were they? How long was the step/stride? None of this information is given. Take this report with a several gram serving of salt. For those who may not know, Happy Camp is a town at the north end of the Bigfoot Highway from Willow Creek. Folks, if we are going to report such things, let's at least get the details! Otherwise, this is just some guy's melted boot prints on a snowy road. OK? 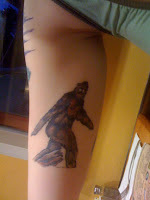 Recently our daughter Denali set up a tattoo doodling service in our Bigfoot Books shop. 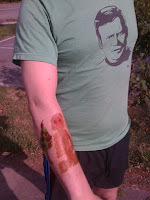 For a friend of ours she custom-designed the permanent ink pen Bigfoot arm tat seen to left. This fellow's girlfriend seems to have been inspired by this, as she now has a real tattooed Patterson-Gimlin Film frame 352 on her own arm. 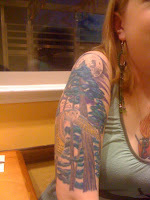 On the other side of her arm is a redwood forest complete with owl and moon. A REVOLUTIONARY STATEMENT IN BIGFOOTING EMERGES FROM OREGON. In other news, Autumn Williams of Oregon Bigfoot has come out with a VERY interesting, and we must say, quite refreshing view of the Bigfooting field, in her recent blog. She calls it "Professional Suicide" (click the link to read the introduction and encounter her three-part, very heart-felt YouTube video declaration), but we would like to at least see a question mark on the end of that title, Autumn. In our view, this public statement makes her immediately one of the most interesting (though certainly controversial) figures in the field of "Bigfoot Research" today. This statement--whatever your reaction or position you take on it--really needed to be made; and we, personally, are glad that she has said it. Click the image box below to view Part One of Three video blog segments. She says that there is something, for apparent lack of a better term, "icky" about the Bigfoot research field today. We'd have to agree, so far as all the egotism and interpersonal recrimination involved; but further, one has to wonder why the search for an unknown creature would require so much machismo, gear and guns and big trucks, traps and tricks, camouflage, and "paramilitary" behavior. How, Williams asks, does this bring us CLOSER to these creatures? Are we not just driving them, and the witnesses of them, away? She goes so far as to imply that there is something somewhat perverse about the fixation on evidence, spoor and proof of Bigfoot. We ourselves have often felt there is indeed something kind of pornographic about the obsession with Bigfoot artifacts, something conquistadorial and predatory about the pursuit of the Creature and the fixation on its image. There is a strong desire to "capture" the mysterious, to "own" and possess it. Autumn Williams speaks as a "witness advocate," aruing that we should respect witnesses, not judge them, nor "interrogate" them as if they were members of the Taliban. She suggests (as we take it) that we, rather than "hunting" Bigfoot, should become more sympathetic with it and its way of being. The failure of decades of aggressive pursuit of the Sasquatch is telling. These efforts have mainly failed to "prove" the Creature, she argues, and this may be because of its macho tactics and (as we interpret her words) aggressive imposition of the human modality upon nature. We agree, in great measure. No one has really ever understood nature and the Mystery of the world around us by conquering, killing and dissecting it. Squatch where you live! Think (and feel) like a Squatch. Live like someone that a creature such as Bigfoot might actually want to get to know. Otherwise, we are just out there possibly scaring them further away into the remaining corners of a diminishing habitat. Aggressive Bigfoot "hunting" is something like a "colonial" incursion into the domain of another Being, one of apparent grace and intelligence--do we really want to repeat this process again in this country? Be an explorer, not a conqueror. Think of how Jane Goodall and Dian Fossey found and studied the gorillas and chimpanzees--through patience, subtlety, compassion, and gradual understanding, they learned how to dwell with the creatures without offending them, how to be more than human, in a way, and accepted by them. Bigfoot/Sasquatch does not need for us to prove anything to the world; but can we prove ourselves worthy of them? What Autumn is proposing includes awareness, openness to new experience and the “unknown,” a participation in the world rather than against it. We'd bet anything that she is largely right–that it is more important to be sensitive to the reality of Sasquatch than to “hunt” them. We say: by all means, get out there in the field. Seek encounters. Find evidence where it may be. Show the world that Sasquatch is real. But, don't do it at the expense of the witnesses or the Creature or your own human dignity (hint, hint, GCBRO!). Seek to find the natural ways in yourself--this will bring you closer, and make your research all the more effective. Field research IS important, but we must always consider tactics and whether they actually work. What will bring us into the Mystery, rather than bringing the mystery, diluted, dead or corrupted, to us? We are all "witnesses," if we open our eyes without presumption. And if we are to be "researchers," we should be careful not to put the cart before the horse, our presuppositions over what actually IS. Autumn was a repeated childhood witness, with her mother, on the family's rural Washington land. These were encounters demonstrative of habituated interaction with the Creatures, as documented in her mother's book, VALLEY OF THE SKOOKUM. At the age of 16 Autumn herself became dedicated to the field of serious Bigfoot/Sasquatch research, eventually founding the Oregon Bigfoot organization and website, and hosting the show, Mysterious Encounters. The latter show was produced by Doug Hajicek of White Wolf Entertainment (Sasquatch: Legend Meets Science), for the Outdoor Life Network, 2003-2004. A Few Other Views on This Matter... LINKS. The Blogsquatcher: Autumn Williams' Witness: Allowing researchers access to bigfoot like letting pedophiles into a daycare. BigFootForums Thread: Autumn Williams says she is no longer a BF researcher, Video Blog "Professional Suicide"
BFRO Forum Thread: Autumn williams hangs up her "Researcher" hat! Oregon Bigfoot: FEEDBACK Autum has received from supporters. Linda Martin's Bigfoot Sightings: Bigfoot: to Research or Not to Research? CRYPTOMUNDO posted something on this early Tuesday morning, but now the link is dead. Did they chicken out, or what? All we know is what we can retrieve from the FaceBook posting they did: "Autumn Williams’ Message May Be A Warning Sign. Look more deeply than you have been asked to by the supposed hostile intent of the new videos." OK, Loren, the mystery... thickens. In any case, think for yourself. We are seriously wondering at this point how this will play out at the Oregon Sasquatch Symposium, coming up in June in Autumn Williams' home town! We'll be there, sitting in the very same room as David Paulides. OMG. How many more fake blobs and hu-man in monkey suits me have to see? Joker hu-man think he funny, make movie of self in costume, think he fool hu-man. He not fool me. Laugh at Bigfoot? Mess with Squatch? Me know difference between Bigfoot baby and porcupine in tree! Me see shadow or stump and know it shadow or stump! If me see porcupine me eat! But if me see hu-man me go far away. They so stupid and stinky me never imagine actually eat one. I could, but me not going to. They think I "gentle giant" not hurt fly, that why me no eat hu-man. They wrong. Me not hurt human because me just no like, and me know it taste bad like rotten dumpster! This blog, save for archival/historical or promotional product images (fair use, for research only), copyright 2010, Bigfoot Books Intergalactic and Steven Streufert. Please feel free to quote with citation and link to this blog included. Hello! Speak your mind. Let me know someone is actually reading all of this stuff! We moderate the comments here, but will let everything through that is not either blatant Spam or vile hate speech. Don't worry if your comment doesn't appear immediately--it is just under review. Thanks! BIBLIOGRAPHY OF BIGFOOT, YETI AND SASQUATCH. Books and Other Media Read by Steven Streufert. 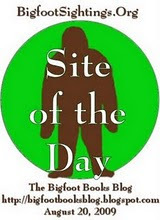 BLOGTALK RADIO Appearance by Bigfoot Books' STEVEN STREUFERT on SQUATCHDETECTIVE, with Steve Kulls, 1/20/2010. The 1st One. RADIO Appearance on MNBRT, by STEVEN STREUFERT, IAN and ROBERT LEITERMAN. The Bluff Creek Film Site Project with ABE on Blog Talk! THE COALITION FOR REASON, SCIENCE, SATIRE AND SANITY IN BIGFOOT RESEARCH. A Facebook Group. 2010 OREGON SASQUATCH SYMPOSIUM, Day Two. BFF Tyranny Overthrown. BIGFOOT'S BLOG on Facebook. What is "Research"? Anatomy of a Bigfoot Hoax DVD: Biscardi at it Again. The SquatchDetective Report on the Georgia Bigfoot Hoax. Support the Bigfoot Discovery Museum! Believe It Tour on the Road to Bluff Creek, Squatching Brush Mountain Lookout, Bigfoot SITE OF THE DAY! BIGFOOT'S BLOG BANNED FROM THE BFF! Boycott the Bigfoot Forums! Blue Creek Mountain and Bluff Creek Timeline, Response to our Paulides Blog. January 4 2010 UPDATE! BLUFF CREEK 2010 Spring Exploratory Mission, Bears, Bigfoot Burgers, More! BLUFF CREEK and the PGF: Talks with Green, Byrne, Fries, Barackman, Perez. Site Location Theories. Creatures Seen by Seven-Year-Old Girl! LETTER TO A YOUNG SQUATCHER, More Discussion with a Skeptic, Anthropomorph Attack, "Bigfoot People"
LETTER TO A YOUNG SQUATCHER, Part Two: Guest Blogger Andrei Galic; OSS News, Links, AUTUMN WILLIAMS' "ENOCH"
Nine-Year-Old Rediscovers BLUFF CREEK P-G FILM SITE! One Year Anniversary of Bigfoot's bLog, UFOs on Horizon? Ray Crowe's THE TRACK RECORD out on CD from NABS! Robert Leiterman Guest Blogger: Bluff Creek Film Site Project, Journey of Re-Discovery, CONFIRMATION! ANGRY BIGFOOT Coup d'etat of Blog! Hairy Creature Takes Over. MNBRT RADIO APPEARANCE, Bluff Creek Film Site Project SPEAKS! THE COALITION FOR REASON, SCIENCE, SATIRE AND SANITY IN BIGFOOT RESEARCH. A Facebook Group You Should Join! Willow Creek's BIGFOOT DAYS 2010, 50th Anniversary Coming Up! BLOGTALK RADIO: John Green and Bob Gimlin on Larry Battson's Wild. Explorer of hidden dimensions of meaning and reality. Willow Creek, CA 95573-1167, USA. Bigfoot Books is an all-purpose used and rare book shop located in the heart of Bigfoot Country, and specializing in Sasquatchiana, among many other interesting things. Be sure to view our BLOG ARCHIVE and Outside Link sections below. They may be browsed by subject or by date. Fan B-Blog on Facebook: Get News Flashes and Updates! PATTERSON-GIMLIN FILM SITE REDISCOVERED... and DOCUMENTED. The BLUFF CREEK FILM SITE PROJECT Reaches Preliminary Conclusions re. the Location of the True PGF Site. Petty Dictators Rule the BFF! BIGFOOT'S BLOG Manages to Annoy the Hell out of the Bigfoot Forums and We Get Banned! "Everyone has the right to freedom of opinion and expression; this right includes freedom to hold opinions without interference and to seek, receive and impart information and ideas through any media and regardless of frontiers." FAIR USE NOTICE: This blog may contain copyrighted material. Such material is made available for educational purposes, to advance understanding of human rights, democracy, scientific, moral, ethical, and social justice issues, etc. This constitutes a ‘fair use’ of any such copyrighted material as provided for in Title 17 U.S.C. section 107 of the US Copyright Law. This site contains links to materials on third-party websites, which are provided for informational and/or educational purposes only. The source of all such content is clearly identified. This material is distributed without profit. "All content provided on this blog is for informational purposes only. The owner of this blog makes no representations as to the accuracy or completeness of any information on this site or found by following any link on this site. Some of the content on this site may be satirical or parodic, and is not meant to be taken literally. The owner will not be liable for any errors or omissions in this information nor for the availability of this information. The owner will not be liable for any losses, injuries, or damages from the display or use of this information. This blog believes in the concept of Free Speech, as guaranteed in the Constitution of the United States of America, and will exercise this right as enacted individually and by its participating comment makers. Those commenting on posts express their own opinions, which are not to be construed with those of the author/owner of this blog. Those who would sue someone over Bigfoot and resultant chat really should get a damned life and move on from all of this. These terms and conditions of use are subject to change at anytime and without notice." Original text and photos on this blog site Copyright, 2003-2015, Steven Streufert, Bigfoot Books.. Watermark theme. Powered by Blogger.